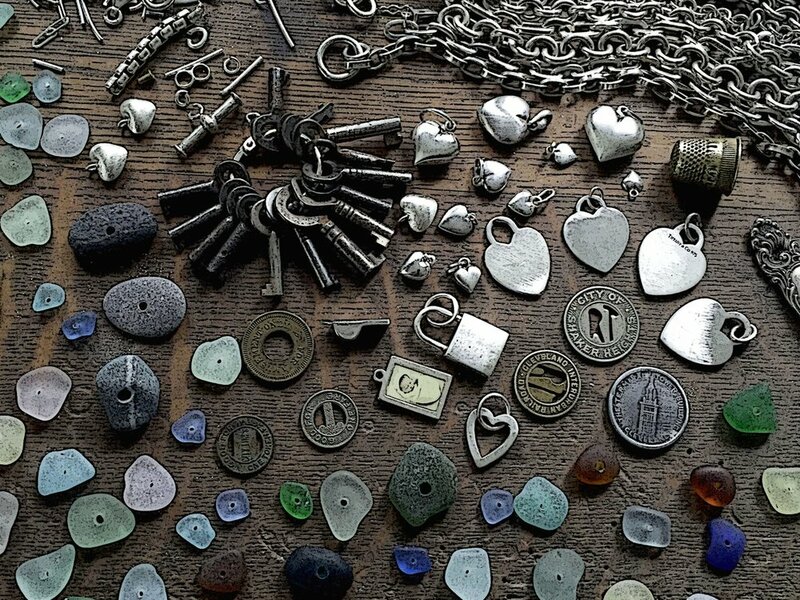 Sea glass, beach stones, vintage silver charms, chains, thimbles, tokens, hearts, locks, keys, silverware, and vintage beads all find their way into SToNZ Jewelry creations. SToNZ pieces are both rustic and elegant, feminine and badass, imperfect and durable. They are meant to be fiddled with, layered, collected and passed on. Many pieces are hand stamped with personal meaningful statements, or made from customer's own old jewelry parts, silverware, beach finds, and charms, that they want to have incorporated into custom made keepsakes. SToNZ inventory is constantly changing, but if you see a sold piece that speaks to you, perhaps something similar can be made just for you. Just ask. Welcome to SToNZ. I'm so glad you're here. My creative passions led me to art school (Go Blue!) where I earned a BFA in graphic design and illustration. I worked as a professional illustrator at American Greetings in Cleveland, OH for more than a decade, and continued to do design work for a variety of clients from my home-based graphic design studio (SmARTwork Studio, Inc.) while raising my identical twin daughters. Spending that much time on the computer made me miss the hands-on act of MAKING things. So I decided to revisit my passion for metal and stone. As a child I spent most of my summers at the beach. The seaglass and beach stones I collected over the years were filling bowls throughout my studio and home. One day it occurred to me that I could creatively combine my two passions: making beautiful jewelry, and beach combing for natural treasures. (Oh, and foraging at estate sales and flea markets for old keys, tokens and vintage sterling silver jewelry parts. Make that three passions.) The result is SToNZ. For me, one of the most gratifying things about making SToNZ treasures has been the discovery that there are like-minded people all around the world who connect with the SToNZ aesthetic and find great joy in wearing and collecting my work. Someday I will have a (beach!) party and invite all of you, and it will be the MOST amazing gathering of wonderful folks ever. You people ROCK.